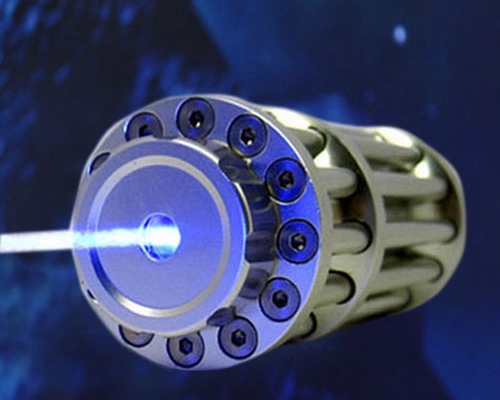 Details: The 3W blue laser is a Class 4 laser that puts out up to 3000 milliwatts of power. The 3w blue laser beam is strong enough to burn holes, pop balloons, and start fires from across the room. The beam,with 50 miles range, is so bright that it can be seen from outer space! The most powerful and iconic handheld laser in the world is yours with affordable price. The most powerful and brightest blue laser pointer, the most powerful handheld blue laser! 3W blue lasers contains the important IR filter, which will protect your eyes, but it's good for you to have a blue laser goggles. You will get the laser goggles for free if you buy this blue laser pointer. Save 39$ ! The 3W blue laser is much larger than other handheld laser pointers. Genuine 3 watt blue laser diodes, shock resistant, passive thermal cooling and advanced pump and driver assembly.